The Abraj al Bait Towers, also known as Makkah Royal Clock Tower, are a residential and hotel complex that can be used either by men or women, which is near Masjid al-Haram in Mecca, Saudi Arabia. It took eight years to build them and they are seven towers put on podiums, among which the tallest is the one that has the clock Makkah Royal and that, with 601 meters of height, is one of the tallest skyscrapers in the world. Why were the Abraj al Bait Towers Built? Abraj al Bait Towers were erected with King Abulaziz funds, whose aim was to modernize the city and provide the increasing number of visitors that come to the city, either as pilgrims oras tourists, with first class accommodation, without forgetting about the city residents. 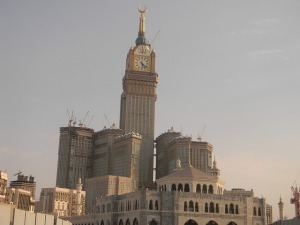 The land on which the Abraj al Bait Towers haven been built has twenty-three hectares south Masjid al-Haram mosque. In order to give place to this stunning construction, the historic Ajyad fortress, which dated back from the Ottoman era, had to be demolished. The total constructed area is of 2.800.000 m2. The seven towers are distributed in a podium of 15 storeys and it is 115 meters high. The main skyscraper, the Royal Clock Tower Hotel, is situated in the center of the structure, while it is escorted by three towers on each of its sides, being their names: Hajar, ZamZam, Maqam, Qibla y Marwah, which are between 200 and 300 meters tall and have between 42 and 48 storeys. The main tower counts with an incredible illumination thanks to the two million LED lights which provide the tallest skyscraper in the world with clock with bright and clearness. The clock is 43 x 43 meters. From the cusp of the main tower it raises a column that ends in a twenty-three meter half Moon made of glass fiber and gold coated. What is there in the Abraj al Bait Towers? The Abraj al Bait Towers have either residence zones, as well as the five-star Fairmont Hotels & Resorts where pilgrims stay, a shopping center with a car parking for more than a thousand vehicles, a towe of the Islamic Museum, a lunar observation center and a prayer room which can hold more than ten thousand people at the same time. The buildings have room for 75.000 residents. Those who live in Abraj al Bait Towers say their prayers formally five times a day. The podium has seventy-nine lifts, one hundred and eleven escalators. The Clock Tower has ninety-four lifts and sixteen escalators, while the minor towers have twelve lifts, two more lifts exclusively for the heliport and six escalators. The engineering companies Dar Al-Handasah, Premier Composite Technologies and the materials company Gurit were the responsible ones for the construction of such towers and of their coating. Why is Mecca important for Muslim religion? What are the requirements for traveling to Mecca? Why do muslims pilgrimage to Mecca? What is the most important Mecca and why?